The What: Gefen by Core Brands, a Nortek company (NASDAQ: NTK), announced the DVI over HDBaseT 2.0 KVM Extender (EXT-DVIKA-HBT2), its first KVM solution to utilize HDBaseT 2.0 technology. The new product is designed to extend DVI, USB 2.0, RS-232, and two-way analog audio up to 495 feet over one Cat-5e cable. 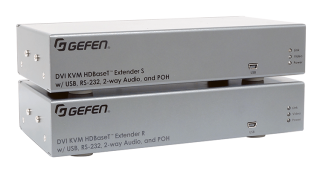 The What Else: Gefen’s newest DVI extender utilizes the power of the updated HDBaseT 2.0 spec with new features. The EXT-DVIKA-HBT2 extends DVI video signals at resolutions up to 1920x1200 (8-Bit, 4:4:4) up to 150 meters. It also extends HDCP 2.2 and 1.4 compliant HDMI 2.0 sources at resolutions up to 4K UHD and 4K Cinema at 60Hz 4:2:0 chroma subsampling at 30Hz 4:4:4, using Gefen DVI to HDMI cables. Along with digital audio/video, this device extends most USB 2.0 devices. The EXT-DVIKA-HBT2 also boasts bidirectional audio, allowing the extension of line-level audio from sender to receiver, and mic or line-level audio from receiver to sender. “Gefen already offers a single-cable solution that integrates both DVI video and USB extension, and the EXT-DVIKA-HBT2 is our first KVM solution that adds two-way audio and power extension over a single Cat-5e cable,” said Core Brands’ Gefen product manager, Jason Fitzgerald. The new HDBaseT 2.0 Colligo platform is designed to facilitate an even more robust and resilient connection than the industry standard HDBaseT. When used with Gefen DVI to HDMI cables, supported HBR audio formats include Dolby Atmos, Dolby TrueHD, DTS:X, and DTS-HD Master Audio. The Bottom Line: The EXT-DVIKA-HBT2 can accommodate a complete workstation including keyboard, mouse, select USB peripherals, microphone, headphones, and powered speakers. The sender and receiver units can be rack mounted (using EXT-RACK-1U), surface mounted, or be placed on a shelf.